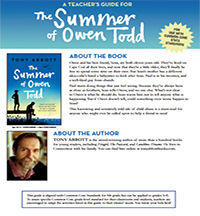 Our discussion guide for The Summer of Owen Todd, a novel about a boy keeping his abuse a secret, provides resources to not only help your students understand the text, but also aid them in comprehending the theme of abuse presented throughout the novel. Use our pre-reading activities to spark a conversation about true friendship and what students believe the novel will be about. Once the class finishes the novel, use our discussion questions to test students' comprehension of the reading and what they felt the important scenes were. Also provided are activities that ask students to revisit what friendship means and how they would react in Owen's position. Owen and his best friend, Sean, are both eleven years old. They’ve lived on Cape Cod all their lives, and now that they’re a little older, they’ll finally be free to spend some time on their own. But Sean’s mother has a different idea—she hires a babysitter to look after Sean. Paul is in his twenties, and a well-liked guy from church. Paul starts doing things that just feel wrong. Because they’ve always been as close as brothers, Sean tells Owen, and no one else. What’s not certain to Owen is what he should do. Sean warns him not to tell anyone what is happening. But if Owen doesn’t tell, could something even worse happen to Sean? This harrowing and sensitively told tale of child abuse is a must-read for anyone who might ever be called upon to help a friend in need.